A perfectly timed yellow flag handed the orange DeVilbiss car a victory on the walled streets of Toronto. Josef Newgarden happened to be pitting when Tony “Time To Call It Quits” Kanaan committed his latest brain fade and careened into the Turn 1 tire barrier. As a result, Newgarden ran away with it for his second win out of the last three times north of the border. Scott Dixon was rudely hit by “Sour Grapes” Will Power – twice – during a first lap melee bringing out the first of only two cautions on the day. Power limped around the course failing to make it to his pit and would be a surprise first out. Dixon soldiered to a tenth place finish and as usual no infraction was called on the Penske pilot. In front of all the banging, Helio grabbed the lead from Simon Pagenaud in a ballsy inside move at the start and TK managed to gain five spots, but it was Josef Newgarden’s jump of three positions to fourth that ultimately made all the difference. He’d soon find himself out front and, due to both timing and luck, in possession of another street course victory. Verizon’s new data plan got more than enough mentions Sunday, but its IndyCar series championship suffered a real blow as viewers’ attention spans were severely tested at Watkins Glen. Pole sitter Scott Dixon commandingly ran away from the field in another fuel saving snoozer on a roadie, winning by a whopping sixteen seconds ahead of Josef Newgarden. Things at the back of the pack did become interesting though, with exploding Firestones, Will Power practically taking himself out of the points chase and drivers fighting for their jobs. Silly season hung over the paddock like a shroud of Finger Lakes fog. Three caution flags flew for a total of nine laps, which at the Glen are long at over three miles. Muscovite Mikhail Aleshin was seemingly victimized by a sniper’s round on lap fifteen, his left rear Firestone exploding in an extremely rare total tire failure. The bumper disintegrated in a spectacular display of collateral damage as he spun, collecting no one and brushing the wall. The SPM jockey, who like many others grew furious after being penalized in qualifications, as usual acquitted himself well in interviews afterward, looked ahead to the next race and further ingratiated himself to a growing number of fans. We envision some sponsorship on those blank red sidepods, and soon. IndyCar put on its second consecutive extraordinarily exhilarating oval track race in less than a week. Enduring a year long winless drought, Graham Rahal won the closest race in Texas Motor Speedway history Saturday night charging all the way from lucky thirteenth. 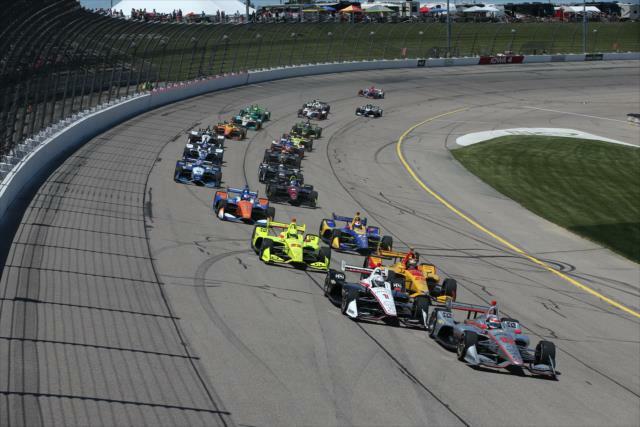 The race, started in June and rained out after the first seventy three laps and a horrific collision between Conor Daly and Josef Newgarden, proved an instant classic. The restarts were exquisite, the action and passing superb. It was like the good ol’ days of racing at Texas back in the ’90s and early ’00s, with a photo finish and the margin of victory a mere eight thousandths of a second. The race was breathtaking. The Toronto track’s too narrow, ramshackle and winding, making the racing too processional for our tastes. Especially with the recent changes to pit lane and curbs coming apart mid-race – that’s Detroit level awful. It’s high time to reconsider Toronto’s place on IndyCar’s already sketchy schedule.